Zorro is a classical Aristocrat pokie that features 25 paylines and a sensational bonus game when you spell out Z O R R O left to right. In this Australian pokie machine you will come accross Zorro, Juliana, Monastario, money bags, black stallion and barrel symbols. The game features the aristocrat gamble function and includes all the wonderful sound effects that Aristocrat are well known for. When you hit the Zorro Bonus you will be granted one of the following bonuses at random. 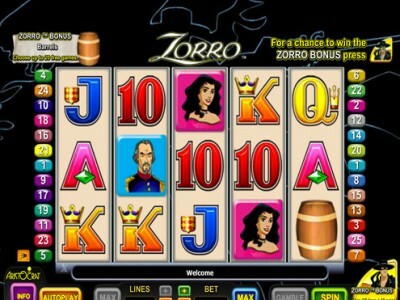 If you have ever wandered into Australian casinos then you will have no doubt come across the famous Zorro Pokies. If you hit a big win you will be treated to the clasic gold coins rushing out to you on screen. Try our free Aristocrat demo version below for free play!